What would you do if extra money were to suddenly land in your lap? According to the IRS, approximately 70 percent of Americans can look forward to receiving a tax refund each year. A mere 16% plan to put their funds towards a retirement savings account or an investment. For Americans who find themselves with extra cash, why is making their money earn even more not the priority? The answer is that we don’t know what to do with our money. Even among the people actually investing in IRAs and 401(k)s, a whopping 60% expressed “little or no comfort” in managing their retirement funds. Topics like the fundamentals of saving for retirement using IRAs are well-covered online and in-print. But alternative investments receive far less attention, despite being a critical part of any well-balanced portfolio. We’re here to change that. After all, limiting your portfolio to more conventional investment holdings leaves you vulnerable to the whims of a limited segment of the market. An alternative investment refers to any asset beyond the conventional types of stocks, bonds, or cash. They more commonly include hedge funds, managed futures, venture capital, private equity, and commodities, but they can also include cryptocurrency, precious metals, and even real estate. A general number to go by, as suggested by firms like Morgan Stanley and Merrill Lynch, is to place 20% of your portfolio into alternative investments. The barrier to entry tends to be the high minimum investments that are often required as well as the wide range of investment types available, making it difficult for the individual investor to characterize. For example, it’s easier to know what parameters to look at with a stock in order to assess risk or at least gauge performance than it is to know how a rare coin will bear value over time. The coin market is smaller, and there is a heavy reliance on authentication and appraisals. A vital part of successful investment strategy is understanding what you’re getting into. When considering alternative investments, use the following checklist of questions to ask as you start organizing your thoughts. How does my investment gain or lose value over time? What are the most common mistakes associated with such investments? What sort of timeline should I expect for buying, holding, and selling this investment? What fees and taxes will I have to pay? How can I legally minimize them? 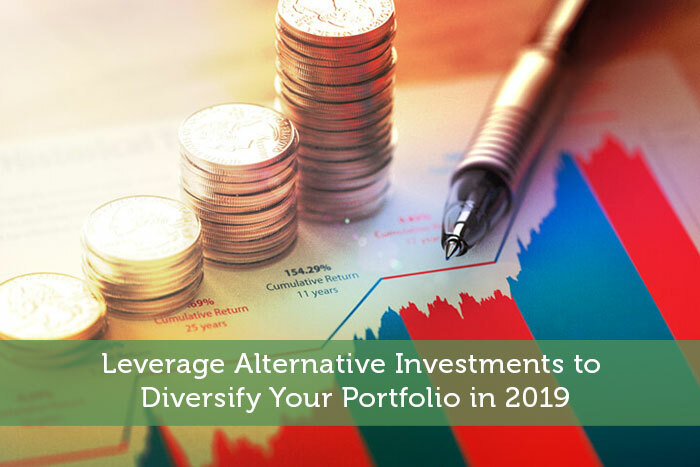 Here we’ll walk through a high-level overview of some of the most common types of alternative investments and address some of these questions, to give you some exposure as you start to consider diversifying your portfolio. A hedge fund is a managed investor partnership, meaning a group of individuals ‘goes in’ together, pooling their investments so that they can minimize individual risk. Each hedge fund has its own manager who guides the investment strategy, following a set of guidelines specific to the hedge fund. Hedge funds may be specific to a type of asset class, including real estate. Managed futures are similar to hedge funds, although they prove to be more favorable to some as they are more conservative and tightly regulated. They are run by commodity trading advisors (CTAs), who are subject to an FBI background check and must maintain thorough documentation. Managed futures tend to cluster around specific commodity classes, like metals or grains. This is a very effective way to diversify, because the performance of these commodities tends to generally function independently of the traditional money markets, if not thrive when other assets like stocks suffer. Another form of investment is making a financial contribution in exchange for equity – or a stake – in the business, which is usually small or medium sized. Companies present reports to potential VC investors, and even after you’ve given money they will continue to provide regular reports. As one of the investors, you have a voice in the business’ affairs, which is proportional to the size of your stake. If the business does well, the value of your investment grows. If you are concerned that a business seems potentially risky, you might want to add in some alternative means of recuperating your money. A royalty program, for example, will generate income for you regardless of whether the business is enjoying a net profit or loss in the fiscal quarter. Bringing your concerns to the attention of the other investors can help you collectively bargain. You will certainly need to consult with a professional financial advisor to make sure you are documenting everything about your investment properly as well as filing the appropriate taxes. Many individuals find that being a VC investor can be very involved, but by that same token can yield high rewards beyond just the financial. You can be immersed in the up-and-coming business scene, stay on top of growth, and network with other successful professionals. Because these are vital to modern-day life, there is always some level of economic activity surrounding each of these categories. These commodities are always being traded to some level, although their relative scarcity at any point in time affects their value. The basic speculation you are making when investing in futures commodities is whether the price will go up or down. When you “buy” a commodity, you are actually betting that the price will go up. Based on that, the farmer (or whoever is generating — and selling — the asset) will fulfill his side of the contract by generating the amount of purchased corn at the current price. Aside from the capacity for a single individual to turn profits by speculating “correctly,” major businesses that use a particular commodity can ‘lock in’ a specific price by buying the commodity now at its current price. Even if the price then goes up, they have claim to the amount of the commodity that they purchased at the current price. A long-standing idea is that there is room for tremendous profit in commodities, although this is accompanied with high risk on your investment. Cryptocurrency acts as an asset class of its own, with market volatility generally classifying it as a high risk, high reward investment. We’ve all heard the stories of people who bought bitcoin early, and then watched as its value skyrocketed over time. By that same token, we’ve also seen thousands of people who rapidly went from huge wins to epic losses. Not all cryptocurrency is created equal. Newer coins are more susceptible to fluctuation. One way to keep yourself safer is to invest in cryptocurrencies designed to solve problems, such as Ethereum with its smart contracts. These are less likely to fail — their purpose gives them a layer of relative stability. Much of crypto’s volatility stems from its relative infancy, but there are ways to exercise caution and set yourself up for success. Much work has done to develop crypto market statistics that help evaluate the relative performance of different currencies over time — and can even help you identify how long you should aim to hold on to your crypto investments for maximum reward. These statistical insights help with the fact that cryptocurrency is decentralized. Although there is debate over who should be managing the regulation of crypto, advocates point to its decentralization as an alluring feature of this currency — and one that reduces the likelihood of corruption. What if I told you that art, wine, cars, and coins outperformed conventional investments—like stocks—in 2018? In fact, there are a lot of reasons a potential investor might steer clear of luxury investments. These assets do not generate dividend income, but instead offer returns through appreciation. Both the supply and the market are limited; and while this does keep the prices high, it also puts the power in the hands of brokers and appraisers. The power really sits with the wealthy. The spending habits of the financial elite determine the long-term market for luxury assets and drives their fluctuations in value. Interestingly enough, the increase in the number of baby boomers who are wealthy enough to play with luxury assets is one reason for its growth. However, the direction of the growth – including the shift away from traditional artwork – has everything to do with the reduced prevalence of art education, which have made these works less appreciated by investors – and therefore less valuable. Tax laws around assets vary according to where the investor lives. You will also need to factor insurance and storage into the costs of these luxury assets. Between its potential to generate passive income via rentals through the chance for increase in worth as neighborhood property valuations go up, real estate is a promising alternative investment. It can be easier to wrap your head around the value of a piece of purchased property than some of the financial investments listed earlier. Being able to directly interact with and utilize the investment makes a difference as well. You can easily wrap your head around the quality of life associated with the property you buy: what it’s like to furnish it, what the school system nearby is like, and even what sorts of tax changes can be expected. It can even provide buyers with the fulfillment of a hobby. The competitive nature of buying a house makes the process attractive to some. Flipping a house – or buying a very low-priced, often poorly maintained place only to renovate its design and sell it for far more – is so thrilling, there are even television shows dedicated to it. So why doesn’t everyone invest in real estate? The biggest barrier to entry is the high upfront cost. Buying real estate is expensive, and financial professionals advise against borrowing money for investments. It usually takes a lot of planning and diligent saving in order to accumulate the thousands of dollars needed for such an investment. Starting small and gradually growing your portfolio by holding and selling strategically is how most property investors get their start. You can also leverage rentals to your benefit, be they ongoing or vacation rentals. Either way, you can supplement any of your existing income with what comes through from real estate. If you don’t want to deal with a property, there are other options. You can invest in real estate funds, such as an exchange-traded fund (ETF), mutual fund, or REIT. All of them diversify your investments and allow you to dip into real estate, just without having to buy property. Alternatively, you could invest in a real estate company. If you invest in real estate, be sure to consult with an advisor regarding taxes, which range from property taxes through rental income taxes. While you can get a break from managing a rental property through the deduction of expenses, there are a wide range of taxes to be aware of. The IRS allows you a deduction to account for depreciation over time. Upon sale the IRS takes back a portion of the deduction via “recapture.” The 1031 Exchange is a workaround that exists for investors with rental property, so you can defer capital gains taxes and continue depreciation as long as you comply with specific guidelines for your purchase and documentation. Alternative investments are a critical way to distance some of your money from traditional market volatility and engage with more personally appealing assets. Particularly as you consider retirement, you may want to combine your investment with something that gives you joy, such as a collector’s car. Balance financial responsibility with self-care — make sure you are paying yourself first. Review your holdings with a trusted financial advisor. Don’t be shy to consult with colleagues and mentors, and benefit from their experiences.